Sun-Dried Tomatoes is a cute little cookbook that we received for our wedding in 1995, which makes it a candidate for the longest-unused cookbook of the collection. 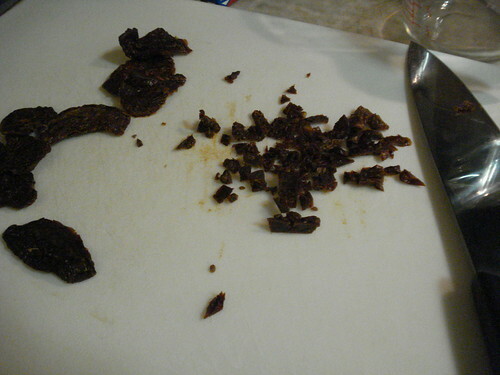 I think sun-dried tomatoes were trendier back then, but trend or no trend, they are a delight. Drying captures the intensity of the tomato, and dried tomatoes help infuse a richness into any dish. Recipes range from the tomatoes themselves to dips, salads, entrees and breads that incorporate them. 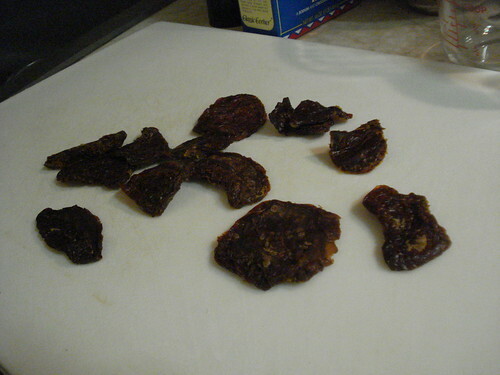 The book offers recommendations for drying your own, but since I have no garden or dehydrator, and am not eager to prop the door to a gas oven, I opted instead to buy sun-dried tomatoes. You can get them dry-packed or packed in oil; both have their virtues. I like to keep a supply of the dry-packed ones around because they last for eons so you can improvise at will. For the project I decided to prepare an entree so the tomatoes could be a major focus of the meal; that seemed most appropriate to the spirit of a thematic cookbook. 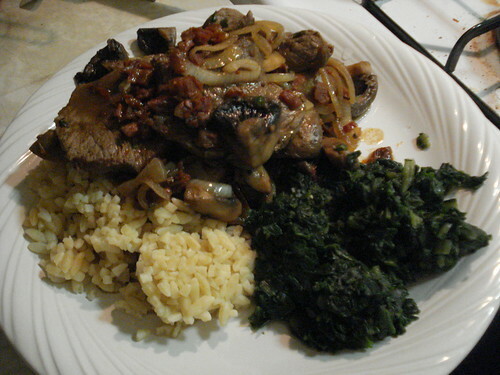 I chose seared sirloin strips with dried tomatoes and mushrooms, because the dish sounded both easy and tasty. I chose well. 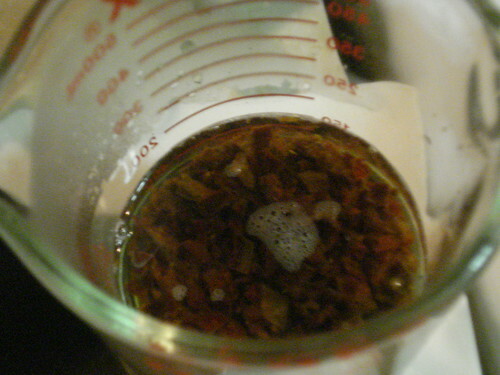 I started by chopping up about a dozen dry-packed tomatoes and rehydrating them in half a cup of boiling water. While they soaked up the liquid, I sliced some onion, minced some tarragon, and quartered some mushrooms. 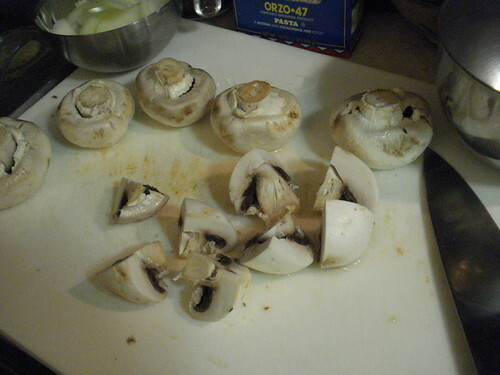 (The recipe actually called for whole button mushrooms, but I couldn’t find those anywhere, so decided that quartering would get the basic white mushrooms closer to the appropriate size.) 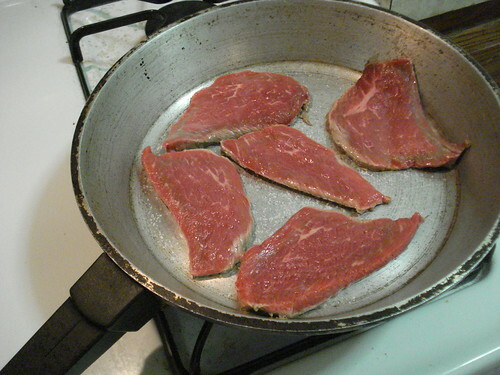 Then I sliced some thin strips of sirloin roast, and it was time to cook. I started by searing the sirloin strips on both sides, then set them aside and sauteed the mushrooms in some melted butter. Those went aside with the seared beef, and I added some more butter to the pan and sauteed the onions. When they were soft and translucent, I added the tomatoes (along with their soaking liquid) and the tarragon, then added the mushrooms and beef to the pan and let it all cook together for a few minutes. I served the mixture over orzo, with some spinach on the side. Verdict: Success. The final dish was tasty. 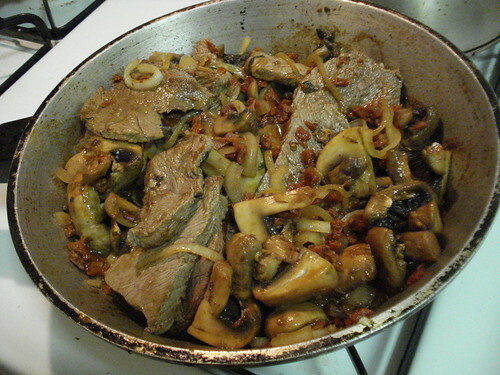 The tomatoes and onion were a rich foundation for the beef and mushrooms. The effort was minimal — it would have been even less if I’d found whole button mushrooms — yet the dish had a gourmet feel to it. I will be making this again.